18-port, Gigabit switch delivers high-quality performance and reliability for business-class management, security and speed. Numerous QoS features ensure that traffic is prioritized properly to deliver the best possible user experience for real-time applications like voice and video along with bandwidth-intensive graphic/video file uploads and downloads. IGMP snooping limits IP multicast traffic to the ports that requested it, enabling the rest of the network to operate at peak efficiency. Smart switches help secure networks through port authentication and MAC-based port security, requiring clients to authenticate themselves before any data is passed. Advanced DHCP snooping and IP-MAC binding functions ensure network integrity and help prevent network attacks. Spanning Tree Protocol (STP) and Storm Control features let you confidently build a mesh of switches and quickly expand your network to support your growing workforce. 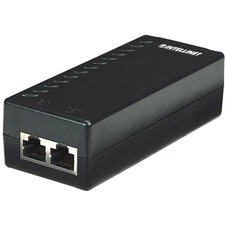 Ethernet adapter features a USB 3.0 connector on one end and a Gigabit Ethernet port on the other, making it easy to establish a wired Internet connection using your MacBook Air, Chromebook or Ultrabook. 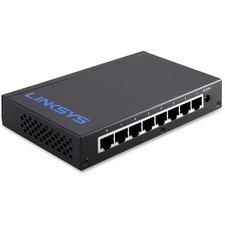 Gigabit Ethernet port transfers data 10 times faster than Fast Ethernet to provide a high-speed connection for your wired devices. USB 3.0 port lets you share files and add external storage across your network. Easy-to-use design makes installation fast and simple for immediate use. Slim, flexible construction is perfect for the business traveler who needs a secure and fast wired connection in a hotel or at a conference. Universal design connects to any Ethernet-enabled device with a network port. 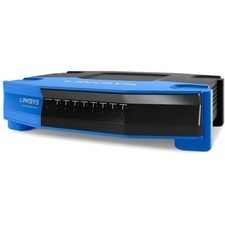 Eight-port, business switch offers Gigabit speeds to minimize transfer times and greatly enhance the ability to stream high-bandwidth files to connected devices without interference. Wired connection speed up to 1000 Mbps accelerates your performance and productivity when sending large files. Plug-and-play technology provides a quick, easy installation to quickly extend your office network. Auto-sensing ports automatically optimize the speed for each connected device. The auto power-down feature disables unused ports for maximum efficiency. 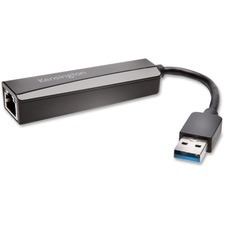 Kensington USB 3.0 Ethernet Adapter - USB 3.0 - 1 Port(s) - 1 - Twisted Pair Many newer laptops do not come with an Ethernet port, leaving users only WiFi to get connected to the Internet. The UA0000E USB 3.0 Ethernet Adapter provides a wired connectivity option with lightning fast transfer speeds where wireless access isn't available or if you have a broken internal network card. 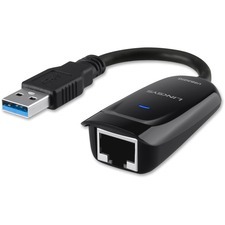 The USB 3.0 Ethernet adapter simply plugs into an available port on your laptop or desktop computer and supports 10/100/1000 BASE-T performance. The adapter is compatible with systems running Windows 8.1/8/7/Vista/XP, as well as Mac OS X 10.6 and later. 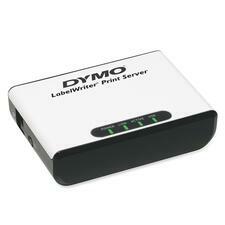 Easy-to-set up network device connects the Dymo LabelWriter 400/450 series label printer or the LabelWriter 4XL directly to your network, giving members of your workgroup access from their computer. LabelWriter Print Server comes with easy-to-follow instructions, AC power adapter and all the software needed so installation is simple. Windows and Mac network compatible. 26-port, Gigabit switch delivers high-quality performance and reliability for business-class management, security and speed. Numerous QoS features ensure that traffic is prioritized properly to deliver the best possible user experience for real-time applications like voice and video along with bandwidth-intensive graphic/video file uploads and downloads. IGMP snooping limits IP multicast traffic to the ports that requested it, enabling the rest of the network to operate at peak efficiency. Smart switches help secure networks through port authentication and MAC-based port security, requiring clients to authenticate themselves before any data is passed. Advanced DHCP snooping and IP-MAC binding functions ensure network integrity and help prevent network attacks. Spanning Tree Protocol (STP) and Storm Control features let you confidently build a mesh of switches and quickly expand your network to support your growing workforce. 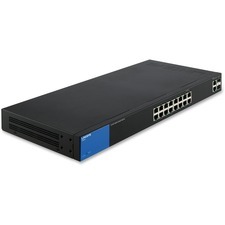 Does your existing LAN switch not support the new IEEE 802.3af PoE standard? Well, don't let that stop you from realizing the benefits of delivering DC power over the existing Cat5 Ethernet cabling. Use the Model 503389 PoE Injector until you are able to upgrade your LAN switch to a model that supports the IEEE 802.3af PoE standard. Now that you are running DC power to your networked equipment through the Cat5 cabling, you need to be sure that the products are protected from power problems. The PoE Injector was designed to protect equipment from short circuits (short GRND), current overloads (over 450 mA) and high voltages (voltage exceeding 52 V). Gigabit Ethernet switch offers exceptionally fast wired speeds and versatile connectivity. 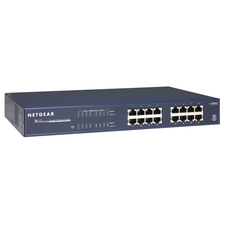 Gigabit Ethernet ports transfer data 10 times faster than Fast Ethernet for high-speed connectivity for your wired devices. QOS traffic management reduces buffering by prioritizing high bandwidth activities. Auto-sensing ports maximize data flow and set the optimal speed for each connected device. Easy-setup technology makes installation fast and simple without requiring a CD. Power-saving mode maximizes energy efficiency and helps you save on your electric bills.